Mr. Kieu Hoang is an American entrepreneur and philanthropist, originally from Vietnam. He is the CEO of RAAS, Inc (USA) and Vice Chairman of Shanghai RAAS Blood Products, China. Since 2010 Mr. Kieu Hoang has focused his research in areas of wellness that improve the quality of life. Through his studies on different foods and plants, he has come across numerous findings. Studying Red wine in particular caught his attention. In his research he found that good healthy cells did not just exist in human plasma but also in red wine; he found that a small grape has 5000 more genes than a human being. In his findings, Kieu Hoang Wines showed the highest level of High Density Lipoprotein among more than 100 tested items. 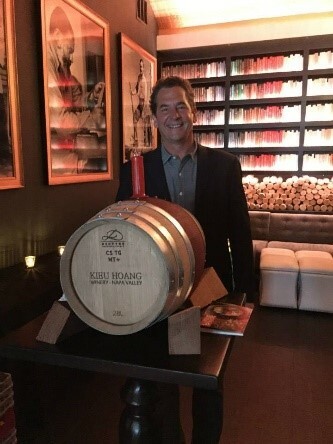 His findings and passion for wellness led him to travel to the world famous Napa Valley, California and work with experts, including renowned winemaker Charles Hendricks to establish the Kieu Hoang Winery. 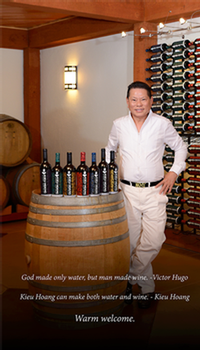 With 38 years of experience in sophisticated fermentation, PH adjustments and cold stabilization, Mr. Hoang presents the world with his exclusive line of wines. Kieu Hoang Winery is located in Napa Valley in the Carneros American Viticultural Area (AVA). 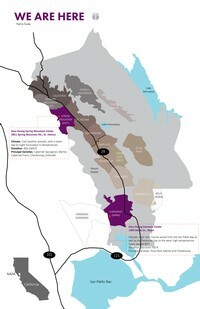 The Carneros District is the southernmost grape growing region in Napa Valley. The fog and evening breezes off nearby San Pablo Bay make the Carneros AVA the coolest wine producing region in the valley, ideal for growing Chardonnay and Pinot Noir. Mr. Hoang purchased the property in June 2014 from Michael Mondavi Family Estates. Robert Mondavi, Michael’s Father was a leading California vineyard operator whose technical improvements and marketing strategies brought worldwide recognition for the wines of the Napa Valley in California and set the standard for New World wines. Mr. Hoang chose to purchase the property because of The Mondavi name and winemaking legacy. Kieu Hoang Winery owns a second property located in the Exclusive Spring Mountain District located in Napa Valley. Kieu Hoang Winery purchased the facility from John and Shawn Guilliams. The Guilliams family has been operating the Spring Mountain Facility since 1979. Located above 2,000 feet, it has seven acres of vines. Kieu Hoang Winery will be producing its high end limited production Platinum Label out of Spring Mountain. Kieu Hoang Winery has partnered with Charles Hendricks to produce its finest and exclusive labels. Charles is a 1982 UC Davis viticulture graduate, well-grounded in the science of winemaking. Over the years Charles has worked in both Napa and Sonoma Counties, gaining hands on experience in all aspects of winemaking. He has built a strong reputation for the passion of excellence throughout the industry.